On a day that started like any other...Mia had everything: a loving family, a gorgeous, adoring boyfriend, and a bright future full of music and full of choices. Then, in an instant, almost all of that is taken from her. Caught between life and death, between a happy past and an unknowable future, Mia spends one critical day contemplating the only decision she has left--the most important decision she'll ever make. 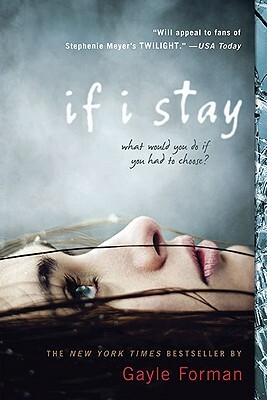 If I Stay is a beautiful novel filled sadness, love, happiness, and memories. I loved every moment in this book, and I enjoyed reading it. I finished this book in a day, for Once Upon A Readathon, but I'm glad I did, because I knew I had to finish it as soon as I started reading it. This book is definitely memorable and unforgettable. Plot- The plot is very good, there weren't many slow moments in it. My favorite parts of the plot were the memories that Mia shared while in her coma. The novel starts out fast, and continues in a quick pace, and I loved it. This is a book that I definitely won't forget, it was that good. I had high expectations for it, since many bloggers had given it such great reviews, and it was even better than I thought it would be. I fell in love with the story the moment I started reading it. Characters- The characters were great, very well-developed. I was able to relate with all of the characters, and I loved all of them. I never grew tired of the characters, they were all wonderful. Favorite Character- My favorite character would have to be Adam. He was so kind and loving, that I couldn't help not to love him. Least Favorite Character- I didn't have a least favorite character, I loved them all. No one got on my nerves or made me angry, so I can't pick one. Writing- This book is filled with beautiful writing from Gayle Forman. I fell in love with her writing style, and I can't wait to read more from her. I loved every part of this novel, and I loved Gayle's writing the most. Cover- I love the cover, it just makes you feel sad. You get the feeling of this book from the cover, and it is really pretty. The one thing I disagree with is that it says it will appeal to fans of Twilight. I don't think it was anything like Twilight, it wasn't even paranormal. But still, it is a beautiful cover. I recommend this to fans of Before I Fall by Lauren Oliver, because as soon as I started reading it, it reminded me of Before I Fall. It isn't exactly like it, this book definitely has different qualities than it. It was a beautiful and tragic book that I loved. 3. Writing- 18 out of 20 points. Gayle Forman is an award-winning author and journalist whose articles have appeared in numerous publications, including Seventeen, Cosmopolitan, The Nation, and Elle. Her upcoming novel, Where She Went, will be published in April 2011. She lives in Brooklyn, New York, with her family. Really like the look of this. I was going to buy it the other day. Nice review. @Amy Thank you! You should definitely check it out, I really enjoyed it! So glad you loved this one! I was such a blubbering mess while reading it. So-so good! 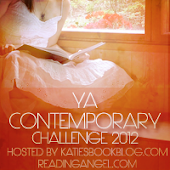 @Just Your Typical Book Blog Thank you! I loved it, and I was crying too while reading it!